Invigorating peppermint and bergamot blended with crisp basil and herbs. Vetiver and woods bring depth to the freshness. NOIR brings casual elegance to the home. 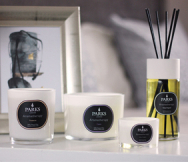 Parks most popular fragrances presented in a classic black vessel. From Sandalwood & Ylang Ylang to Pomegranate & Pink Pepper, these balmy scents are designed to create the perfect evening ambience.